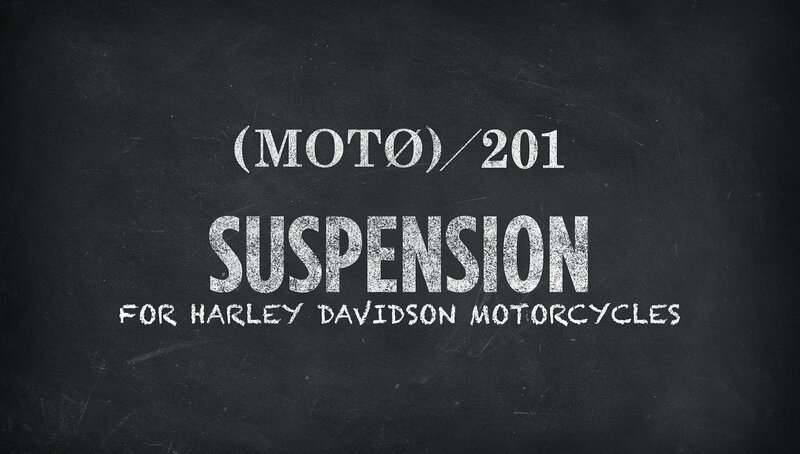 Welcome to Harley Suspension 201. We're not shocked to see you here. Mother Harley leaves a lot to be desired in the suspensions fitted to our two-wheeled death machines. Let’s dive into some Harley history for a minute. Before 1948, Harley Big Twins were fitted with springer front ends. In 1949, with the introduction of the Hydra Glide, hydraulic front suspension became de rigueur and in 1952, the Model K (forerunner of the Sportster) was fitted with hydraulic suspension at both ends of the bike. In 1958, the “drop-seat” frame was introduced on the Duo-Glide, and with it came mounts for hydraulic rear shock absorbers — a fully suspended bike! The name "shock absorber" is a bit of a misnomer. The shock absorber does not actually soak up the shock of the road surface changing — that is the job of the spring. The shock absorbs and dampens the oscillations of the spring, so you don’t hit a pothole and bounce up and down for a quarter of a mile until the spring settles down. 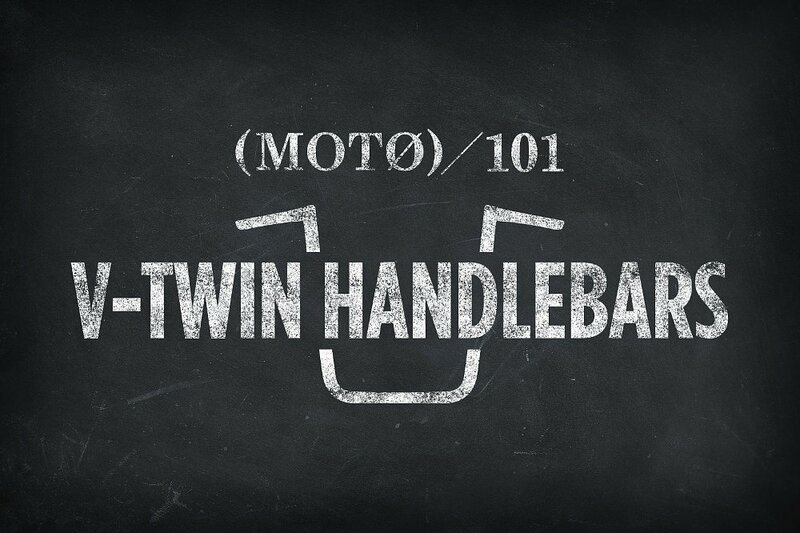 In another twist of words, a “rigid” bike is usually defined as a bike having a hard tail, and a suspended front — hence the other popular term, "hardtail." We’ll use the colloquial terms in this class, but you should be aware of the naming craziness. Let’s talk about some of those early setups, because they have been used for many years, and they have a place in the modern world as well. Riding a springer is not for everyone. They provide a plush, cushy ride that tends to corner poorly. They look trick, though, and they are a popular option for folks running a frame with a rake of 45 degrees and upwards, because a hydraulic suspension tends to work poorly with radical rake geometry. While there are some differences, those general thoughts also apply to other non-hydraulic front ends, like girder and leaf spring front ends (which are largely found in the aftermarket). Rigids offer the appearance of the earliest motorcycles. They handle well on smooth roads, but since they cannot keep the tire in contact on bumpy or washboard surfaces, they perform poorly on many roadways. They also have the nasty habit of providing the rider with a brutally jarring ride. There are benefits, however. They are simple, and rarely break. There are no moving parts. They allow the chain (or belt) to be run with almost no slack in it. They are also allow the bike to be made very, very low, because there is no way for the bike to bottom out in the rear. Modern Harleys have hydraulic suspensions at both ends. Hydraulic suspensions work well for a wide variety of situations most riders are likely to face, hence the reason they are the norm today. Unfortunately (or fortunately, depending on how much you like swapping parts) Harley shocks are very basic. They offer little adjustability and do not perform that well. Like everything on a bar-and-shield product, these components can be swapped out for better performing, more adjustable componentry tailored to your style of riding. Great, but why would I change any of this stuff? That’s a good question. Dirt riders, heavy cruiser owners, and track rats all have different reasons for changing suspension components. However, in our experience, H-D owners usually fall into one of three camps. The first (and smallest) group is composed of the riders who want better road holding and performance from their deathtraps. Suspension pieces for his niche in the market are well made and have a price tag to match. Given the weight of a Harley and the fact that most of these bikes were not developed to really carve corners, it is critical that the manufacturers use top-notch materials and techniques, and those necessities are typically reflected in a high price. Given that H-D is typically not the performance weapon of choice, folks in this group are a special breed who usually know they need very specific equipment and are willing to pay top dollar to get it. The second group of folks we talk to have a big bike, and maybe even are big riders, with big pillions, carrying big amounts of gear (maybe even a trailer). See what we’re getting at? Stock suspensions were designed as a compromise for a rider of average weight, traveling average distances, with the average amount of gear. Exceed those averages fast, hard, and often, and blown-up suspension and crappy ride are your payback. This rider is often on a Touring bike. The third — and by far the largest — group of people we talk to are folks who need “the look.” Too much tire showing, fenders not hugging tires, and frames that sit too high are usually the problems that ail this group. Remember the average suspension components we discussed? They sit your Harley somewhere between “dirtbike high” and “laying frame.” Most folks want their height closer to one end of that spectrum. One of our Geek Team Leads, Dusty Jim, has his Sportster set up with a Burly Slammer Kit. He occasionally touches a tire to his fender. He’s whip-thin, but a heavier rider might render that bike unrideable in its present configuration. Isn't changing ride height dangerous? Of course. Your mother likely told you not to ride around on a motorbike, but you did that, didn’t you? In all seriousness, it can be dangerous. We offer all sorts of parts to modify your suspension. Raising or lowering your bike can change trail, compression and rebound characteristics, ride height, vehicle load capacity and all sorts of stuff. As much as these components can help you get the look or performance you’re after, if they’re not done in a safe fashion, you very well can turn your motorcycle into a bockety shopping cart with a wheel coming off. If you don’t know what you’re doing, don’t do it! It is cheaper to pay a mechanic than a hospital. Now, in less grim terms, some generalities we have found to be helpful. If you are going to lower a bike, it almost always needs to be done at both ends. It might not be an equal amount, but moving one end lower and not the other usually causes handling to suffer greatly, to the point of danger. Keep your trail measurements in mind. You might not even have to measure your setup. So many people have modified H-D suspensions, there is almost certainly someone who has measured their new geometry running the same gear you are considering, took pics, and posted them on the Interwebs. Decreasing the trail (or causing negative trail, which is seriously not good) will cause your bike to range from having “quicker” steering to downright terrifyingly dangerous. The trail measurements of almost all cruisers fall into the range of two to nine inches. Don’t forget your tires. They count! They are an important part of your suspension, and will cause problems if they are not sorted out correctly. Tire height and the distance from the axle to the ground all matter, as do sidewall height and tire construction. If you really are worried about the geometry, buy a kit. The manufacturer has done all the homework for you. The geometry will produce a good-handling bike without making you a pioneer in radical geometry research. Hardtails look dope! What if I do that? Well, there are multiple ways of doing that. We don’t sell whole frames — yet — and weld-on and bolt-on hardtail kits also exist. We recommend trying out the concept first by using a set of rigid struts, just to be sure you like “running rigid.” If you don’t, you can (thankfully) always change back. That’s not nearly as easy with a chopped-up frame. Keep in mind, too, if you have a belt-driven motorcycle, finding longer belts is nigh on impossible. A conversion to chain drive at the same time is almost a necessity. You’ll also often have to fabricate a way to mount your fender, plate, oil bag, and other odds and ends. “Bolt-in” typically assumes the installer is comfortable with light fabrication work. What's the difference between all the types of shocks and springs? They all cost different amounts. (Ha! Man, I am full of bad jokes.) The serious answer to your question is adjustability. Stock suspensions typically offer a constant rate spring and little or no adjustability. High-end suspension gear has a variable rate spring at a minimum, which means that the spring resists the force more powerfully the more it's compressed. What that translates to for you, the rider, is a spring that may offer a better look for your bike, and a bike that reacts appropriately over gentle bumps or huge teeth-clickers. Other pieces could have adjustable preload (to set sag) and adjustable damping for rebound and compression. Nicer units split them. More cost-conscious units usually offer compression damping only. As far as fork springs are concerned, one could get drop-in springs to change ride height, or variable rate kits with spacers and hardware, drop in cartridges, or cartridge emulators for those who are more budget conscious. Air-over-hydraulic conversion kits are available, as are straight air-ride suspension, which is the cream of the crop: adjustable ride height at will, soft or hard as you like it, and independently adjustable to make your trail measurement perfect. Before you go down that road, however, make sure your current suspension is as good as it can be. Adjust the rear suspension for proper sag. Make sure your fork seals aren't leaking. You can switch to thicker fork oil for a little firmer ride. For some folks, this is a good enough solution, especially if you just need a little better performance than what the factory gave you. For others, this just won’t cut it. However, it is a nice, affordable starting point that will get you in the garage spending some time with your honey. If you’ve decided you need a suspension upgrade and want more detailed guidance, get in touch with one our Gear Geeks!